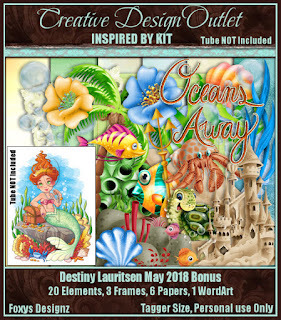 I made an animated tag and snags with the Underwater and fun IB-Destiny Lauritsen - May 2018 kit of Foxy’s Designz. It’s inspired by Destiny Lauritsen tube (Tube not included in the kit). This kit has 20 elements, 3 frames, 6 coordinating papers, and 1 Word Art. You can request this kit exclusively at CDO. You can also be redirected to the store when you visit her blog. Please do not alter or rip the snags. Enjoy!! !